Susan Peek is a bestselling author, mother of eleven, and a Third Order Franciscan. Her passion is writing novels of little-known saints and heroes. All of her novels have been used in Catholic schools throughout the English-speaking world. "Saint Magnus, The Last Viking" and "The King's Prey" were both an Amazon #1 Seller, and "Crusader King" was featured as one of the 50 Most Popular Catholic Homeschooling Books in 2013. Susan has also authored several saint books for young children. She lives in Kansas, where she is busy working on her next novel. Visit her at www.susanpeekauthor.com. The King’s Prey: Saint Dymphna of Ireland, written by Susan Peek, delves deep into the lives of two estranged Irish Catholic brothers, Brioc and Turlough, in their heroic attempt to save the beautiful Princess Dymphna from her insane father, and his sinful desires. After the loss of the beloved queen, King Daemon’s mind and actions border on sheer lunacy. He believes he must marry his innocent daughter, and make her his bride. Brioc, his massive but fun-loving wolf-hound, Samthann, along with Father Gerebran, take up the monumental task of protecting the princess from the king at all costs. Brioc’s pregnant wife, Lynnie, is swept up in the turmoil that becomes their lives, of running and hiding from the king’s soldiers. Lynnie loses sight of Brioc’s love for her as she assumes he has fallen in love with Dymphna. Prayer, faith and trust in the saints, God and Heaven provide our heroes and heroines with divine guidance and intervention. Susan Peek has written a beautiful story of faith in her non-stop action book, The King’s Prey: Saint Dymphna of Ireland. The reader is quickly swept into the lonely lives of Brioc and his older brother, Turlough. Feeling Brioc’s loneliness and pain at being abandoned by his brother at a young age, the reader is soon caught up in the incredible emotional adventure and escape of Princess Dymphna as Brioc, Father Gerebran, and Samthann attempt to save her from the king. This is a story that will hold readers’ attention from beginning to end. Everyone will relate to the emotions and feelings of the characters in this book. The unwavering faith that is portrayed inside these pages is a beautiful gift to the reader. The King’s Prey: Saint Dymphna of Ireland is a must-read for all ages.I thoroughly enjoyed this book. It is very well written, with a great plot, and a beautiful outcome with many lessons to be shared. The King’s Prey by Susan Peek is an adventurous and moving story about Saint Dymphna and the events that led up to her sainthood within the Catholic Church. The fact that it is said to be true, or at least based on a true story, makes this story even more intriguing. It’s set in 629 AD in Ireland and follows a young princess, Dymphna, as she flees from her deranged father, the king. A colorful cast of characters gets pulled into Dymphna’s plight, including two handsome brothers who have been separated by their own tragic circumstances for many years. There is also a huge dog named Samthann that blunders through many of the scenes, adding comic relief in an otherwise suspenseful tale. There are many misunderstandings that take place between characters that cause conflict and heighten the tension as the story goes on. The king and his henchmen make for thoroughly evil villains that gave me plenty of sympathy for Dymphna and her friends. For the most part, I enjoyed reading The King’s Prey. Susan Peek has a comfortable writing style that kept me engaged throughout. The only issue I had was at times she stayed too long in the heads of her characters, causing several scenes to drag. But it was never too long before the action picked back up and I felt carried away in their plight. Her characters are well fleshed out and she did a great job of making them human. I recommend The King’s Prey by Susan Peek for anyone who likes a well-told story of adventure and the triumph of the human spirit. In the introduction to the book, we’re told that the story of Saint Dymphna has been a passion of Susan Peek’s for many years. As I read The King’s Prey, I could sense the passion in her writing in almost every scene. 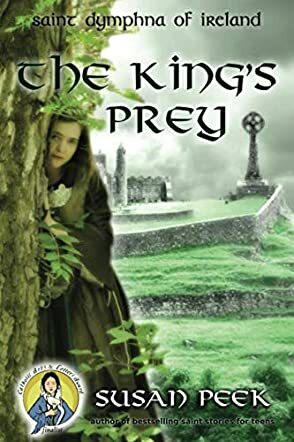 The King's Prey: Saint Dymphna of Ireland by Susan Peek is set against the backdrop of Ireland and brings Saint Dymphna to life. Saint Dymphna is the champion of any soul hurting, in mind or heart, and the story takes readers through broken hearts, misunderstandings, and sacrificial love. Turlough and Brioc are two Irish orphan brothers who come to the rescue of Dymphna and save her from marrying her widowed father, who thinks she is his late wife, Odilla. Dymphna flees the country with the help of a few of her companions. Running parallel to this story is the story of Turlough and Brioc whose entire family is lost due to famine and disease. The story gives readers a saint they can relate to and will love forever, and is also about how she reunites two brothers who are against each other. The story has many layers and I like the way the author seamlessly blends the story of Saint Dymphna with that of the two brothers, Brioc and Turlough. There is a lot of action, drama, and adventure in the plot. A deranged father and his desire to wed his own daughter, Dymphna’s journey across Ireland while escaping from her father, the heartbreaking past of Turlough and Brioc, and the spiritual journey in the story make it a compelling read. The author portrays some strong, uplifting, and inspiring characters through the story and her descriptive narrative skills make the scenes vivid. The author’s attempt in bringing back the forgotten Saint Dymphna through this book works well and I like the way she brings out contrasting themes of evil, sin, violence, ugliness, and turmoil against the beautiful emotions of sacrifice, faith, hope, and courage, and knits them together to give readers an exciting and memorable story. The way the author weaves the two plots together is very impressive. Susan Peek’s best book yet! She has taken this story about a little known saint and created a heart-pounding adventure. As St. Dymphna flees her demented father, her journey across Ireland makes for an amazing story that will appeal to both genders. Girls will be inspired by this strong, kind, spiritual female. While boys will enjoy the equally compelling story of the two brothers, with a heart-breaking past, that help her. The combination of perfectly timed humor, riveting chase scenes, and swashbuckling fights makes for a must read book. The story of “The King’s Prey” interacts with the true story of Saint Dymphna, and creates an adventurous and suspenseful story of cat and mouse. Taking place in Ireland, the narrative follows four points of view. The four main characters are Turlough, Brioc, Ethlynn, and Dymphna. Turlough and Brioc are estranged brothers with an unfortunate past. Ethlynn is Brioc’s pregnant wife. Finally, Dymphna is the daughter of the insane king Daemon whose rule encompasses all the characters. The majority of the story revolves around a chase. When the insane King sought to marry his own daughter Dymphna, she attempts to escape. She seeks help with the ex-minstrel of the court Brioc. However, Brioc’s pregnant wife becomes worried and jealous over Dymphna. Regardless they all flee for their lives. Meanwhile Turlough, a soldier in the king’s army is ordered to find his brother who stole from the king. Choosing family over orders, he follows the trail in order to find and help his brother. Of course with all characters in the dark about the other’s motives, the story weaves a tale of psychological chaos. I will not reveal the end for the sake of future readers, but I will say that Susan Peek has done a very good job at keeping the pace and the suspense up in a story where the reader has no clue what will happen next. Along with the suspense, Peek adds quite a bit of flavor to the story by including a diverse cast of supporting characters. These are Father Gerebran, The soldiers (Neill, Barff, etc), and who can forget Samthann the lovable wolfhound. Altogether, there was never a dull moment in a story that is quite a bit longer than I would have suspected. Well done! I myself, having not been a Catholic and knowing very little about the vast list of Catholic saints, found this fictional story to be a good and respectful way to highlight the traditionally true story of Saint Dymphna who has come to be known as the patron saint of the mentally ill. If you choose to read the story, don’t stop there! Look up the history of Dymphna and it should add to the story in spades.